The Sheraton Apartments is a 107-foot tall, 131-unit apartment tower located at 2909-2913 Highland Avenue in Birmingham. The 11-story, $1 million building was constructed in 1951 by the J. A. Jones Construction Company to designs by architect Horace Weaver. Nelson Weaver and Mark Hodo of the Hodo-Weaver Companies developed the project. The building, on the site of the Culpepper Exum residence, opened its doors on April 15, 1951. Originally the modern-style brick building consisted entirely of efficiencies and 1-bedroom apartments, accessed by a pair of elevators in the lobby. Each unit included hot and cold running water, lights and forced hot-water heat, as well as a kitchen with a stove and refrigerator and metal cabinets. The large steel windows were provided with venetian blinds. Two "fool proof" elevators served the building from the large basement loading area. The exterior was planted with zoysia grass and boxwood. The top floor of the building was built out as Nelson Weaver's personal six-room penthouse. 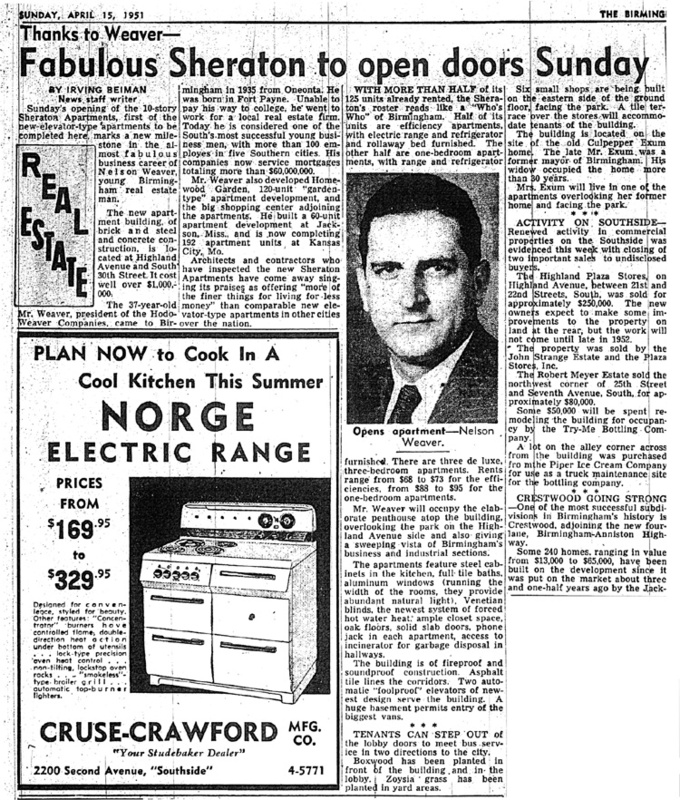 Elizabeth Exum, the widow of former mayor Culpepper Exum, who sold the property, also occupied one of the apartments. Originally the efficiencies and one-bedroom units rented from $68 to $95 per month. Currently the apartments range from studios to 3-bedroom units, furnished and unfurnished, renting from $460 to $1,500 a month. The apartments are managed by Kahn Properties. The east side of the building was extended into a row of seven shops facing Rushton Park with a terrace above. This page was last modified on 13 July 2015, at 08:00.